Using 2 high capacity memory cards in one camera: How about an in-camera SSD? 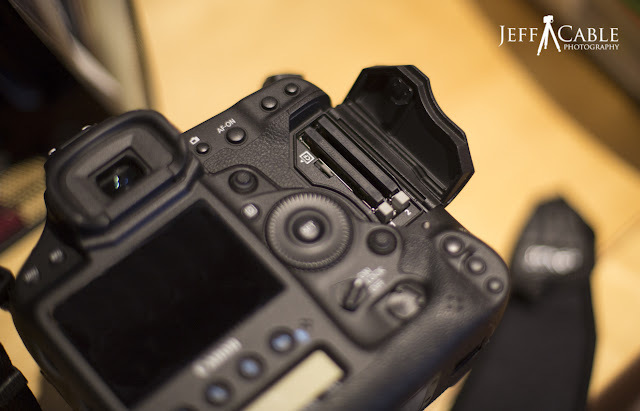 A couple of months ago, I decided to insert a 128GB Lexar Professional 1000x CF card in the second slot of my Canon 1DX and leave it there. Why would I leave the card in the slot for the last couple of months? Because I wanted to see what it was like shooting to two memory cards at the same time and have every image that I shot be backed up in camera. I was also curious to see how many events I could shoot before filling the card. Since both cards in my 1DX were 1000x speed, it did not appear to slow down the 1DX at all, writing to both card slots as opposed to just one. 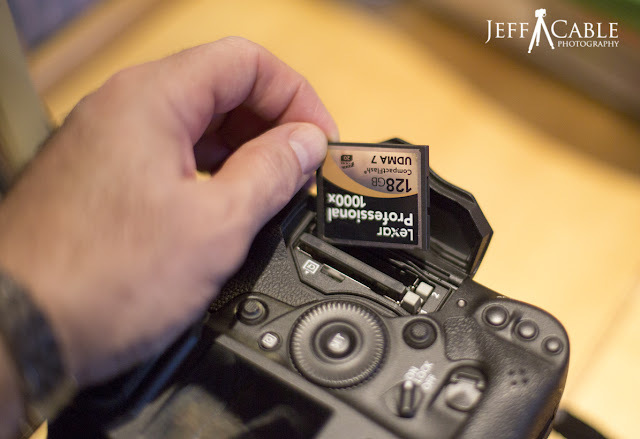 What I love about this high capacity card, is that it is essentially like having a Solid State Drive (SSD) in my camera, giving me that extra piece of mind as I shoot. God forbid I drop a card and lose it, or something goes wrong with one card, I have another to fall back on. With that said, I am happy to say that I have never lost an image from any of my memory cards or lost one during a shoot. Phew! I am going out shooting in San Francisco today (for fun) and plan on keeping that same card in the second slot. The fun continues! Last Friday, I returned from the Consumer Electronics Show (CES) in Las Vegas, Nevada. Most of my daylight hours were spent either presenting or in meetings, but I still managed to get out for a couple of night shoots along the famous Las Vegas strip. A couple of nights later, I decided to walk half of the strip (a 10 mile walking day for me) and took my tripod this time. When in Las Vegas, I usually stay at the MGM Hotel. Since I had a little spare time, I decided to set up my tripod and shoot this image in the lobby of the hotel. I shot this to highlight the angled buildings, which were nicely lit from the lights on the strip. Another view of the buildings.. There are many walkways which cross over the strip. Unfortunately, the majority of them are bordered by large plexiglass panels, making it very difficult to shoot through. I would always walk to the ends of the walkways, where there were clear unobstructed views, to shoot my images. If you saw my blog post from Minneapolis, you know that I was fascinated with building reflections. Once again, I came across a really cool reflection of the Paris Hotel across the street. I took this photo looking over the Bellagio pond towards the Paris Hotel. I purposely shot this before the water show, to highlight the light reflecting in the pond. 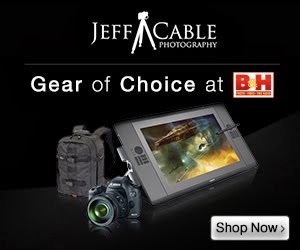 And then I walked into the Bellagio Hotel where I was meeting a bunch of my friends from Canon. I got to our meeting place a couple of minutes early, which meant that I had a little time to shoot images in the lobby of the hotel. Looking straight up, I wanted to capture images of the amazing colors in the "Fiori di Como" chandelier, designed by the famous glass sculptor, Dale Chihuly. Moving around and keying in on certain areas of the chandelier, created so many different views and perspectives. After walking for many miles, I decided to sit down and wait for my friends. I picked a seat that was right under the nose of the gilded horse. I looked up and thought that this would be a cool and unique view of the ceiling. I set the camera low on the tripod, pointed it almost straight up, guessed at the right angle and fired from a low vantage point on the floor. Something different from what most people were shooting in this lobby! This year, like many years, we spent the week in between Christmas and New Years in Mammoth Lakes, CA. For those who have never been there, it is a beautiful place located relatively close to Yosemite National Park, known for their ski resort and winter activities. Most of the time was spent with the family, and not behind the camera. But, since I find so much enjoyment taking photos, I made some time with the camera and the family. This is a panorama image of Convict Lake was taken using 10 RAW images from the Canon 5D Mark III, making it a whopping half gigabyte single PSD file. On the first day there, we decided to go snowshoeing. We all had a good time, but I think Cooper had the most fun. This was the first time that our 1 year old puppy had experienced snow. Woo hoo - this is fun! The funny thing is...we always think of Cooper as a very white dog, but when you get him into the pure white snow, it is amazing how much darker he is against the background. Our daughter, Ali, looking stylish. Our son, Connor, hanging with Cooper. Since my son, Connor, has a lot of experience with DSLR cameras, I had him take a rare shot of me and the puppy. This shot of Cooper was just too darned cute not to include in the blog. I shot this image of this pretty tree while hiking through the snow with Connor. I took this shot of Ali with my iPhone 4S at the top of the slope. I am still amazed at the quality of the panoramic photos from this phone. I shot this photo on the road up to Convict Lake (named for some convicts that escaped from a prison in Carson City in 1871 and then were killed at the lake). I really liked the gentle slope of snow. After looking at the original photo, I decided that this one would look even better in black and white. After shooting some images from the nearby road, I decided to work my way through the snow to see if I could get a better vantage point. When I came across this frozen log, I was blown away. What a perfect foreground subject for my lake shot! Any time I come across something like this, I like to take my time to "work the scene". I shot many images of this ice covered log, using a combination of lenses. These were all taken with the Canon 16-35mm 2.8 lens (ranging from f10 to f16 to get everything in focus). After shooting at Convict Lake for 45 minutes, we headed back to the valley and shot some images. I set the aperture to f16 to give me a nice sun flare and captured this photo. Then it was back to the house for some much needed lunch!